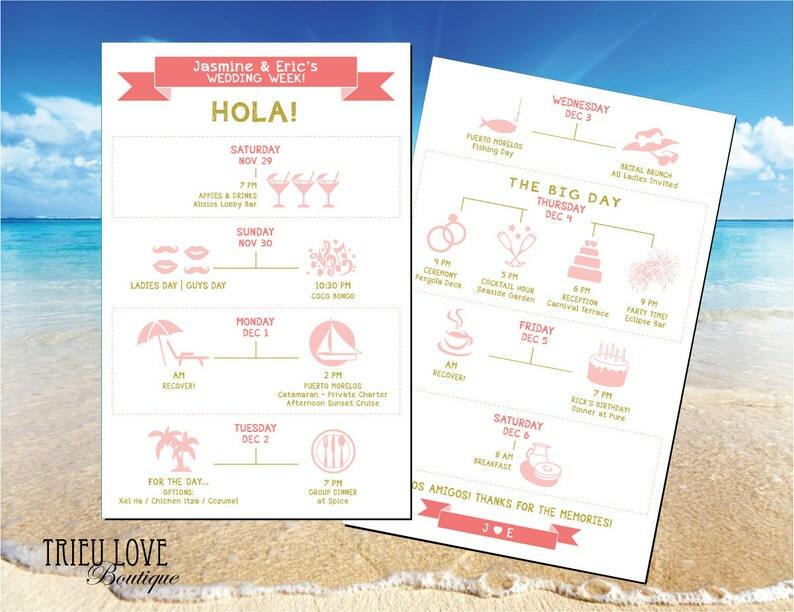 Provide your guests with the week's agenda on their arrival to make sure everyone stays on schedule while having fun! This is a customizable double-sided destination wedding week itinerary that will be 5.5x8.5" (or any size of your choice at no extra cost). Please note that by purchasing this listing you are getting a digital file to print at home. I can print these for you as well, prices are listing at the end of this listing, please scroll down. Purchase this listing and in 'message to seller' include all the details you would like to fit into this design. **I suggest to stay brief with your activity description, keep in mind more text will affect font size. As everyone's wedding activities are different, sizing and spacing of everything will be customized to fit for you, therefore your design may not look exactly like my sample photos. I will choose the best graphics to represent each activity but if you have specific graphics you want me to use please advise. Any color combo can be done for you. I can also color match from any photos you provide. Please note that actual printed colors may vary slightly due to varying monitor screens, this is hard to avoid. **If you are printing from home then it is best we do a blank background, which means your final printouts will have a white background because your paper is white (or whatever color paper you use). Printing colored backgrounds in mass at home can take a lot of ink so I would suggest going to a printer or purchase my printing service if you'd like a colored background. 2 PDF files (1 front 1 back) with your final program design for printing on letter size card stock. There will be guide marks to show you where to place your ruler to make cuts. You can discuss with me in advance if you have other printing plans - like if you are taking it to your local printer then I can make the files to their requirements. After payment and your details are received I will deliver a digital file for your proofing within 2-4 business days. You receive up to 2 complimentary edits and I will resend your proof within 24hrs of your edit requests. After you approve the design, I will then send you a final PDF file(s) for printing. If you require a quicker turnaround please message me, it is most often possible but you just have to check with me first. Paper: 100lb uncoated cover stock in a smooth finish. Double-sided 5x7, 5.5x8.5, or custom, please inquire for other sizes. Printing prices are in addition to the digital design fee presented in this listing, since printing is optional. Please convo me with the quantity that you need and I will create a listing for you. To get a quote on shipping and ETA, please also include your ship-to city/country and I will reply right away.